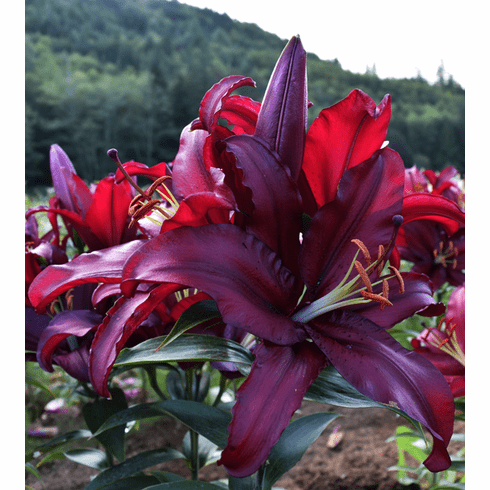 This deep violet lily, with a mahogany colored overlay, is so intensely shaded that is was tough getting a good photograph in the field to show off the gradual bending of colors. As a floral arrangement, it needed bright reds, light pink and white for contrast because after the orange pollen was removed, its color was too dark on the walnut side table. Stems are sturdy and the petals have a slight pie crust ruffle on the edges. The fragrant flowers are strongly upfacing and tend to stay together as they open, making it easy for placing in vases. Fantastic in floral arrangements, the small inset photo shows an arrangement by Dianna for the Northwest Flower & Garden Show in 2010 where this lily was first introduced.